I am currently enrolled in the Chemistry and Biochemistry doctoral program at Laurier. I am working in the “Multiphase Environmental Physical Chemistry” lab under the supervision of Dr. Hind A. Al-Abadleh. I will be completing my degree requirements by September 2019. Research fascinates me and my goal is to build up my career in the areas of teaching and research. I completed a Bachelor of Science (Honors) from Jahangirnagar University (JU) in Dhaka, Bangladesh and a Masters of Science in Chemistry from Memorial University Newfoundland, located in St. John’s, Canada. I worked as a lecturer in the Department of Chemistry at JU and am currently on study leave to pursue higher studies. 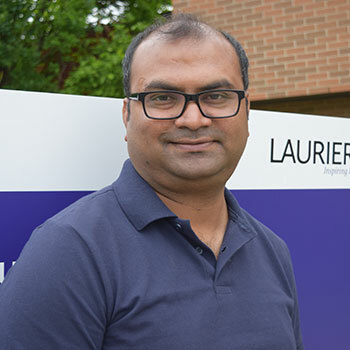 Laurier’s Department of Chemistry and Biochemistry has given me the opportunity to reach my research goals. My research interests center on the interfacial chemistry of atmospherically relevant materials containing transition metals and organic matters as they have many environmental, biological and medical applications. Our research group is concerned with the environmental surface chemistry that presents important and unresolved scientific problems in geochemistry and atmospheric chemistry. The poster that I presented in the Laurier Graduate Poster Showcase explains the behaviour shown by the surface of hematite nanoparticles in the presence of organic matters, particularly those containing carboxylate and phenolate functional groups and different electrolytes such as potassium chloride (KCl), sodium chloride (NaCl) and potassium bromide (KBr). These studies showed that the structure of the organic species influences the type and relative amounts of inner- versus outer-sphere surface complexes. This has consequences on the surface charge as shown from electrolyte concentration-dependent studies. The most interesting part of this project for me is when we collected real-time data and analyzed for the structure of surface complexes and binding strength using Attenuated Total Reflectance Fourier Transform Infrared (ATR-FTIR) spectroscopy. Experiments on the adsorption and desorption kinetics of these systems are currently being conducted and published. These studies are significant because they highlight differences in the mechanism between metal-driven and metal-free oxidation and transformation of organics. I also examine the important role of surface water that is ubiquitous in real-life systems that include field collected aerosols and surfaces of buildings. Since experiments will be performed over short and long time scales (up to six to eight hours), kinetic measurements will simulate atmospheric timescales. The results will improve the accuracy of climate and pollutant transport models and help design tools to mitigate toxicity of inhaled particles.